Although Coronado Island is just two miles from downtown San Diego, it feels like a world away. Photo by Brett Shoaf of Artistic Images. Orange Avenue, Coronado’s one-mile-long main street, resembles the center of a quaint all-American village, complete with mom-and-pop shops, sidewalk cafés, parades, and picnics in the park. As you explore the quiet neighborhoods of tree-lined streets that fan out from Orange Avenue, you’ll find a mix of architectural styles – from preserved Victorians and craftsman-style bungalows to Spanish villas and cozy beach cottages. Located on 28 oceanfront acres, the Hotel del Coronado has been one of the country’s most prominent beachfront resorts since it opened in 1888. Affectionately called the “Del,” the grand Victorian-style hotel, with its iconic red-shingled roof, has fairytale magic and lots of stories to tell. Just for fun, take a historic hotel tour. You’ll be amazed at the celebrities, presidents and princes who have walked the Grand Dame’s halls. Across the street from the Del, and one block from the ocean, sits another Coronado landmark. The (more affordable) Glorietta Bay Inn is a boutique hotel that combines old world charm with contemporary comfort. Built in 1908 as the mansion home of the “Sugar Baron” John D. Spreckels, the Inn’s charming sun-warmed lobby, sitting porch, and music room complete with a baby grand piano, offers spectacular views of the bay. A fascinating 90-minute walking tour of Coronado departs three days a week from the lobby of the Glorietta Bay Inn. Bikes can also be rented to explore the residential neighborhood streets, and the 15 miles of flat paths are perfect for biking, jogging, strolling or rollerblading. 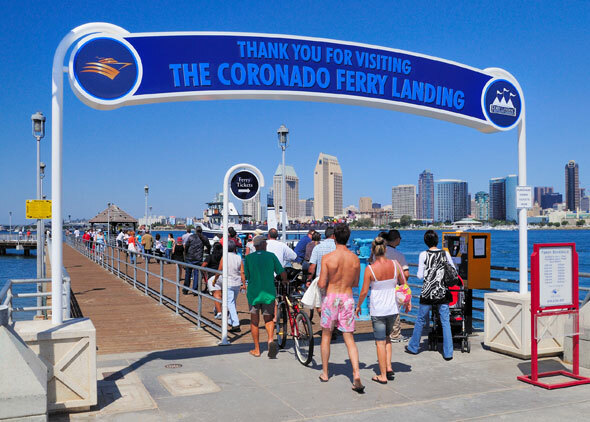 The bay-front bike path is connected to the Coronado Ferry Landing’s wide selection of specialty shops and restaurants. Coronado, with its longtime Navy presence and housing communities, has 21 parks throughout the city – from tiny public parks to the traditional central square at the heart of the island. Coronado’s municipal golf course, with views of the San Diego-Coronado Bay Bridge, is considered one of the finest public golf courses in Southern California. Whether escaping with family, a significant other or for a girls’ getaway, Coronado’s delightful surroundings will beckon you in and beg you not to leave!